The XF4400 can filler is designed for the Artisan Craft Person looking to fill cans with carbonated beverages in a simple and affordable manner. 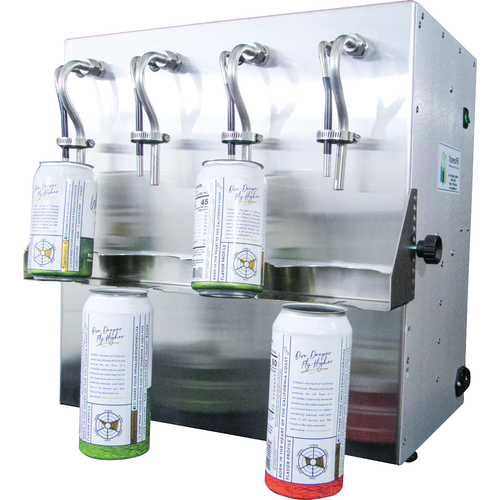 The filler can accommodate most cans sizes with its adjustable shelf, allowing great flexibility, and is suitable for carbonated beverages such as beer and kombucha. The XF4400 is based on the XpressFill Level Filler with modified valves and flow path diameters resulting in a much better flow of product with less foaming and better CO2 retention. Each bottle filler is hand built to order in the California factory. Lead times average about 3 weeks.